Club Marine-sponsored Mark de la Hey starting fishing with his dad at about four-years-old. The family used to camp at Cape Vidal for three months a year – the ideal place to hone his angling skills. If he wasn’t fishing off the beach or the rocks, Mark would be out at sea on their 17ft Yeld Cat – and later, he and his friends started catching fish off their surfskis. At around 20, he got one of the first Stealth Superlite fishing skis. The heaviest fish he’s ever caught on a paddleski was earlier this year – a 37.5kg Amberjack. Over the last 12 years, Mark has filmed and presented over 500 angling shows on TV – on ESA, Reel Angling and now on FreeSpool, the popular fishing programme on the SuperSport channel. When in SA, he uses Yamaha’s SeaCat range of boats, to cover Travel and Lifestyle educational shows for the fishing industry. 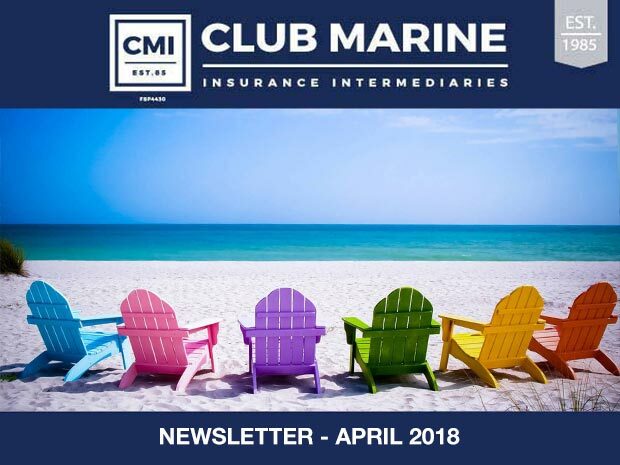 “I have been so well supported by Club Marine over many years – they’ve covered my boats, tackle, paddleski, vehicle and more. They’ve always got my back.” He said. South African competitive waterskier Travis Fisher, started skiing at just four years old. He made his way up the junior ranks and into the open division, winning numerous provincial and national titles along the way. Specializing in the slalom discipline, the Durban-based skier represented South Africa and competed at the 2011 and 2012 European and African Championships, as well as the Under 21 World Water Ski Championships. Not only has Travis competed in the sport of waterskiing, but he has contributed immensely to the growth of the sport. In 2010, he started the Mini League programme in KZN, which has proved highly successful and increased the number of competitors both locally and nationally. In 2014, 2015 and 2016, he spent many months in the USA, coaching and training people on how to waterski effectively. Travis continues to compete today and coaches local skiers in his free time. He also serves on the Waterski Committee in an advisory role. It’s Spring and we love it! It may still be nippy but outdoor lovers are heading out to do what they love most and the leisure industry is coming out of hibernation! Technicians are working feverishly in marine and bike workshops to get their clients up and running – while caravan parks and other leisure destinations springclean and upgrade – ahead of enthusiastic weekenders, holidaymakers, sportsmen and women. Whatever your vibe and wherever you’re headed – we’ve got you covered 24/7/365. Call us – we’ll take care of business while you play! 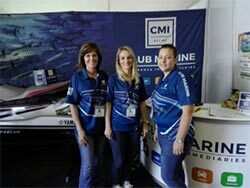 A huge welcome to Janine Dyer (far left), who has joined the CMI Durban Team! She’s pictured here with (L-R) Megan Shepard, Caryne Duvenhage and Cathi Warriner. 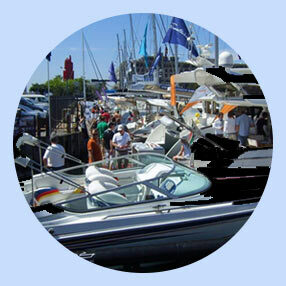 There’s a BOAT SHOW happening – this weekend AT BOATING INTERNATIONAL!!! FABULOUS PRIZES, FUN FOR KIDS, SPECTACULAR SPRING PRICES on BOATS, MOTORS, JET SKIS, WATER TOYS, ACCESSORIES and more! 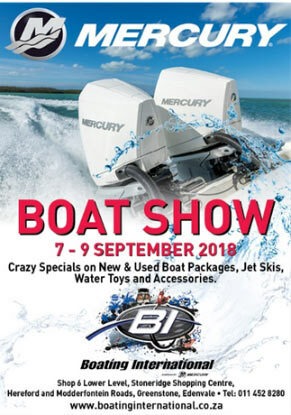 Prizes Up for Grabs: One Year Complimentary Insurance from Club Marine, a Lowrance Hook2 4X Fishfinder, a Kicker Marine blue tooth Radio, Burn Tour coats, Gift Vouchers of R1000 each and others. T&C’s apply. Bring the family and enjoy this fun weekend full of surprises! 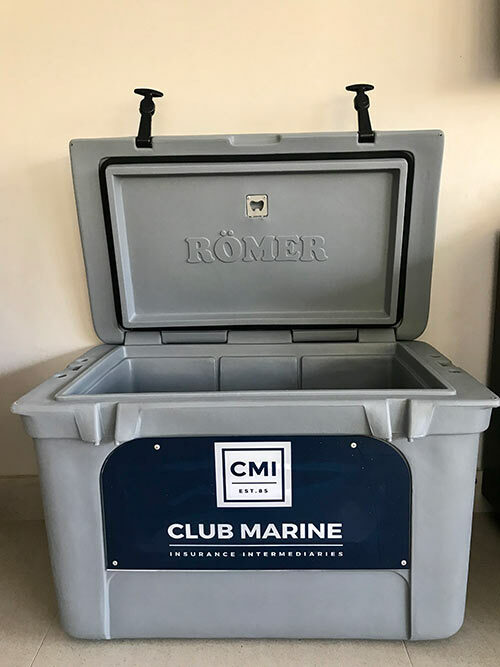 LIKE AND SHARE OUR PAGE and stand a chance to win an awesome Romer Cooler Box worth – R3 500. See winner in December issue. 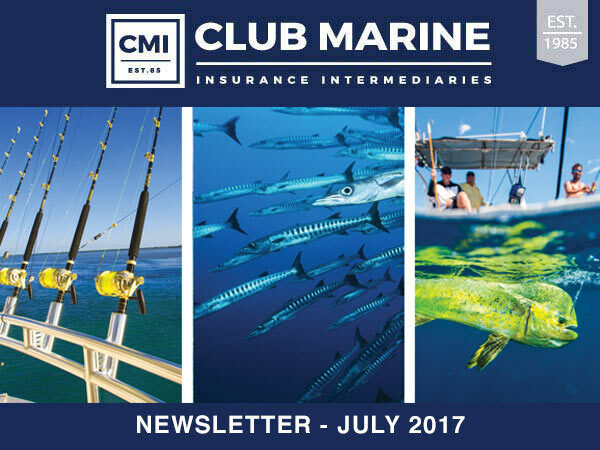 We’ve noticed that several of our Club Marine members have not added any of the Assist benefits to their Domestic insurance policies! 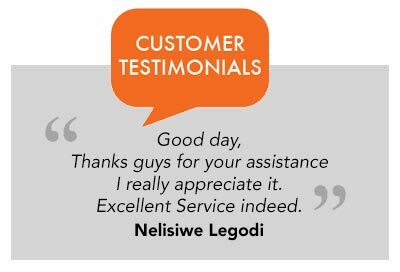 For only R35.50 a month – we encourage you to reconsider! SAVE TO PHONE 24/7 ASSIST NUMBER – 0860 747 247. When you next do your annual COF survey, please check that your Buoyancy certificates are valid. (This also applies when you buy a boat). Recently, there’s been an increase of new owners being given irregular certificates and during the annual boat inspection it’s been discovered that they either have no foam inside the hull or it is filled with an insufficient number of sealed plastic bottles..
All Buoyancy Certificates must reflect a photo of the vessel and serial numbers of the vessel and engines if possible. A date of expiry must appear on a locally issued Buoyancy Certificate. PWC’s (Jetski), operating on inland waters DO NOT require a Buoyancy Certificate. PWC’s operating 1nm, 5nm, 15nm, 40nm and fitted with extra tubbies, roll bars, mounting brackets etc must have another Buoyancy Certificate done for their vessel operating at sea. USA issued Buoyancy Certificates (printed off the internet), must reflect vessel registration numbers and a photo of the vessel. Congratulations to Zimbabwe for winning the Region 5 International Bass fishing competition, at Chicamba Dam in Northern Mozambique. 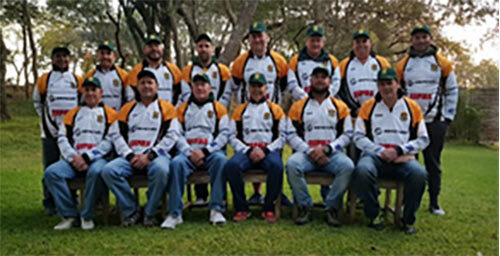 Our Club Marine-sponsored angler Craig Fraser was in the Protea squad which placed second overall – ahead of Zambia, Namibia and Mozambique (Swaziland withdrew). Despite the very cold, wet conditions – a total of 421 fish were caught weighing 606.810kg and averaging 1,408kg. SA WINS AFRICAN FISHING UNION PRESIDENTS TEST 2018! 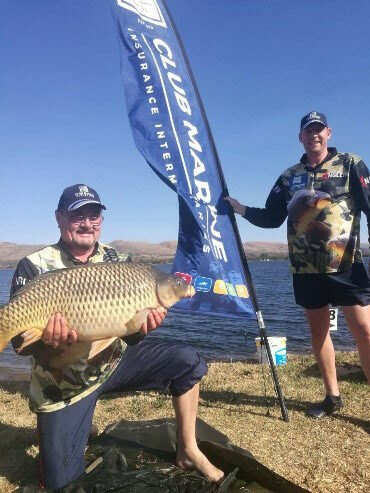 Congratulations to Club Marine-sponsored Bass Anglers Pierre van der Merwe (Captain) and Guy Paulet (Vice Captain) and the Presidents Test side for their recent victory over Zimbabwe and Namibia at Lake Mteri (Zimbabwe)! Pierre van der Merwe (R) with team-mate Michael Cannon. While freezing weather made fishing difficult – a total of 225 fish (averaging 1.910kg) were caught and released over the three days. Greg Schluep’s 4.58kg beauty was the biggest Bass of the tournament. Catching Carp at the recent Hartebeespoort Dam 48 Hour competition! 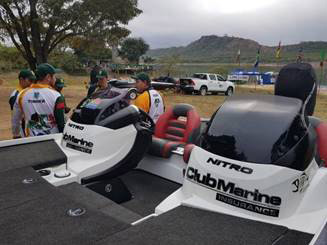 Club Marine-sponsored Peter Labuscagne and Deon Maritz placed 7th overall with their total catch of 21.132kg. Deon broke two personal best records – one of them being 10.839kg! 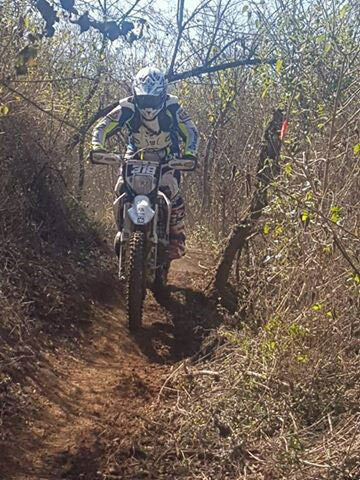 Navigate’s Russell Duvenhage came 4th in the Clubman’s Class of the Enduro Racing which recently took place at Bishopstowe near Pietermaritzburg. 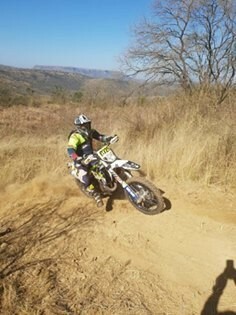 CMI client Bruce Swanepoel, who has come back from an injury, came 3rd in the WOW Class. His nephew, 15-year-old Brandon Swanepoel, was lying second in the Regional High School Class, but unfortunately had to retire on the last lap due to bike problems. Great stuff guys! Who doesn’t enjoy a good party? 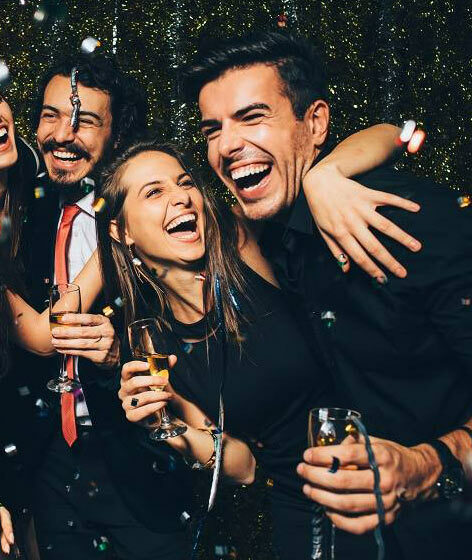 We’ll help you stay safe, while having fun! Pre-book this alternative transport home and you’ll will be driven in your own vehicle by a designated driver. 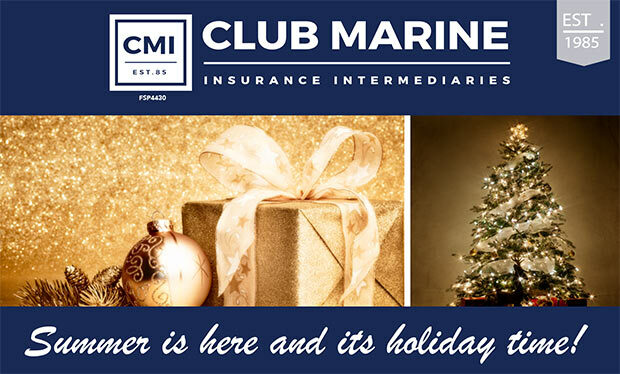 As a Club Marine member, you get six FREE trips a year!! Call 0860 747 247 or 066 470 3368 / 69. Make sure you have your policy/member reference number available. Stop in at the CMI stand and say hi to Cathi, Janine and Megan who will be there to assist you with insurance related queries and updates. Enter our Lucky Draw and you could win a stunning Cooler Box worth R2 500! 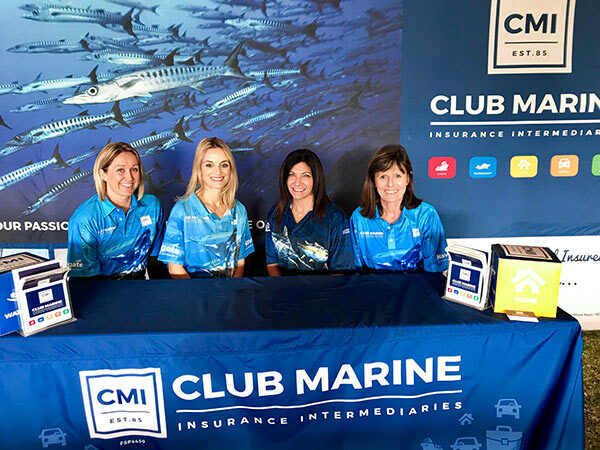 CMI will also provide One Year Complimentary Insurance to the angler with the heaviest Bass – who will win a Crackleback 460 Bass Boat with a 70hp Yamaha motor on trailer. Summer’s around the corner and boaters will soon have the chance to view the latest in Motorboats and Sailing yachts, boating electronics and more…at the Cape Town Boat Show! The boating industry will put their best on display – at the V&A waterfront quayside and in the marquees alongside. your short term requirements: info@clubmarinesa.com. This is a general information sheet and should not be used or relied on as professional advice. No liability can be accepted for any errors or omissions nor for any loss or damage arising from reliance upon information herein. Always contact your legal advisor for specific and detailed advice. Avid Gamefish angler (and Enduro Racer), Stefan started bottom fishing at 8-years-old and by 16 had bought his first Skivee boat. His love of the sport took him to Australia where he chased Gamefish for 11 years and became a member of the “Grander Club” – with his 1120lb Marlin caught in the Lizzard Black Marlin competition. In 2015, Stefan caught another monster Marlin, of just under 1100lbs, at the Mapelane Billfish competition. 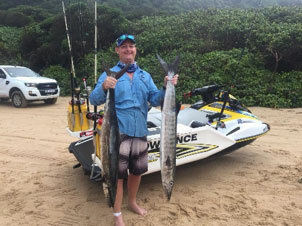 Since moving to Umhlanga 2.5 years ago, he’s joined Umhlanga and Durban Skiboat clubs – and he fishes with Abrie Botha and Navigate’s Russell Duvenhage. 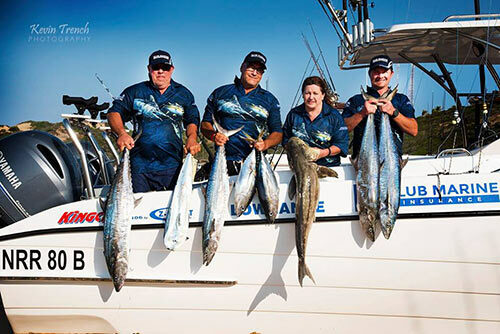 Each year they fish all the Durban competitions, the Billfish 15000 and the Guinjata Bonanza – which he and his team at the time (including Lyn Adams), won in 2012. 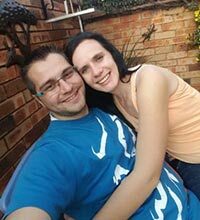 Protea Bass Angler Shandon Hawman, started competitive angling for East Rand Bass Masters aged 16. Two years later he got his Southern Gauteng provincial colours and in 1998 was awarded Protea Colours. He’s fished for South Africa’s premier team 10 times, captaining the side in 2010 against Zimbabwe and in the Zone 6 Internationals in Swaziland. Shandon has also fished in the Presidents Team seven times. Apart from his regular job – he runs Bass Boats SA – an online business selling Viper S, Ruffnek boats and accessories, Mercury motors, Lowrance products and more. Shandon, who skippers for Northerns Division, is also helping his son Slade (13) through the ranks – who hopes to achieve Junior Protea colours in the coming season. It’s a long weekend (for some) and if you’re one of the lucky ones – enjoy relaxing with family and friends and indulging in your favourite pastime! Boaters, bikers, motor cyclists, enduro riders, caravaners, campers, runners… while you head off to your favourite destination, we’ll keep you covered 24/7/365 – at home, on the road, off-road, on the water and cross border. Even your business interests… Buildings, Office removals, Contractors, Import, Export, Travel Insurance and much more! Call us – we’ll take care of business while you play! As announced by the Government on February 21st 2018, VAT increased from 14% – 15% effective April 1st 2018, which was communicated via various media houses and television. Friendly Reminder, to please check your regulatory certificates, boat owners are forgetting to update their (COF) Certificate of Fitness for their vessels. Incidents on the water without the correct and current certificates are not covered by any of the Insurance companies. Congratulations to our Club Marine-sponsored angler Byron Kane, for winning the Racetech Fishing Classic Jetski competition. This is the second time he has won this event. Prizes totalled around R80 000 and Byron took the lion’s share – for his nine-species caught and released over three days. These included Yellowfin Tuna, Skipjack, Greater Barracuda, Couta, Green Jobfish, Rosy Jobfish and a Tropical Yellowtail. 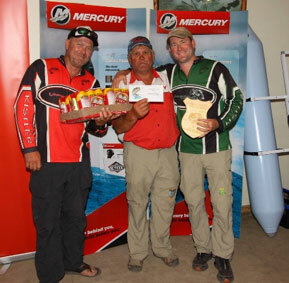 Well done to our Club Marine sponsored Bass fishing anglers Guy Paulet (R) and partner John Rhodes (far left) – are winners of the Heaviest Bag, at the 2018 Amatola Bass Classic recently held at Wriggleswade Dam. Their total bag weight – 5.625kg! 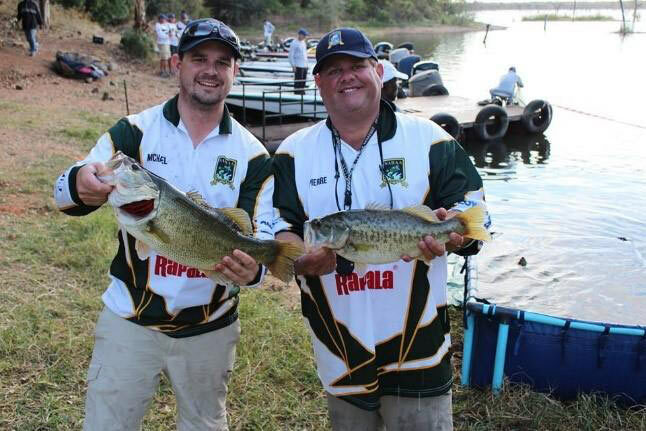 Another of our sponsored anglers, Richard Watson (and Ben van Huysteen) took second place with a bag of 5.165kg’s. 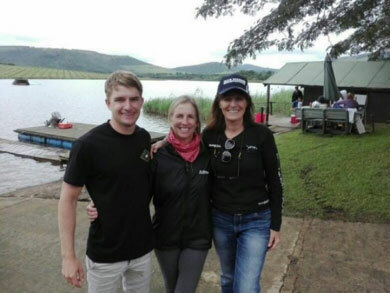 Angela Swain from Cape Town is pictured with Club Marine-sponsored waterskier Travis Fisher and CMI’s marketer Cathi Warriner. 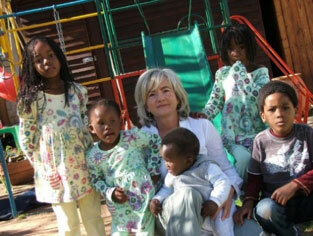 There’s a small residential care facility for children – in Kensington B, Randburg – which always needs help. 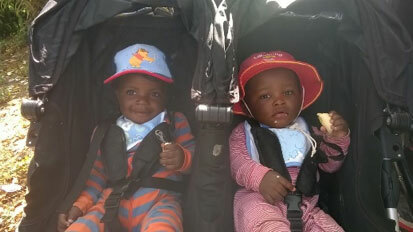 Join us in supporting these little people, who are so much in need. Registered with The Department of Social Development, Miracle Mission provides a home for children in distress – those who’ve been abandoned, abused or infected with HIV. Great news! 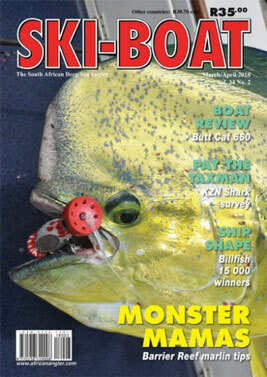 Ski-Boat magazine is now available online on issuu.com and it’s FREE! This is ideal for those who travel a lot and prefer a digital version to read on their phone, tablet or laptop. The magazine will still be printed and paper versions are available from your usual stockists. 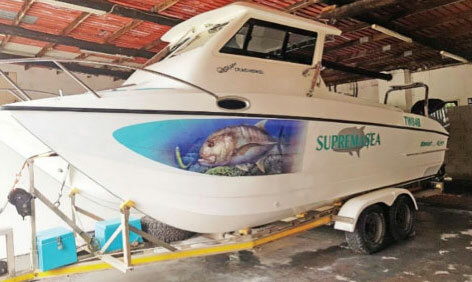 Our new dealer SUPREME MARINE Fibreglass and Boat Repairs has opened in Empangeni – for all your boat, motor and trailer services, repairs, electronic installations, custom builds and certification. 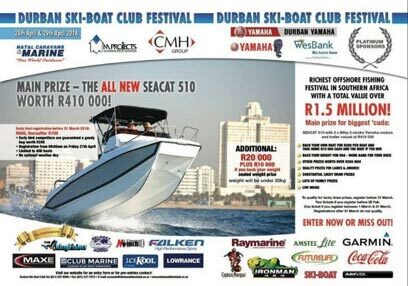 Go down to the new Durban Skiboat Club this weekend for fun, festivities and fishing! Join hundreds of anglers and friends in the giant marquee at the new site (at the harbour entrance) – registration Friday, April 27th. Watch as anglers bring their biggest and best fish to be weighed each afternoon – all hoping to have hooked the ‘Big One’ and one of the magnificent prizes – totalling R1.5-million! EXCITING NEWS …UMHLANGA SKIBOAT FESTIVAL 2018 IS ON ITS WAY! Lots of lucky draws to be won! VAT No: 4750214969 | BEE Verified | Club Marine T&C’s Apply | All Rights ReservedThis is a general information sheet and should not be used or relied on as professional advice. No liability can be accepted for any errors or omissions nor for any loss or damage arising from reliance upon information herein. Always contact your legal advisor for specific and detailed advice. Wishing you a Blessed Festive Season and a Prosperous 2018! And of course… safe travels, fun in the sun and time to reconnect with family and friends. We’ll keep you covered 24/7/365… wherever you are – at home, in your business, on the road or water, so you can relax with peace of mind! While boaters are excited about being back on the water, outdoor enthusiasts are enjoying getting out and about – cycling, bike riding, 4×4’ing, caravanning, trail running and there’ll be so much more. THE LAST SIX MONTHS WENT IN A FLASH – LOOK WHAT HAPPENED! We, and the world, watched in horror as Hurricane Irma, the worst in living memory, wreaked havoc across the Bahamas, Virgin Islands, Cuba and Florida. 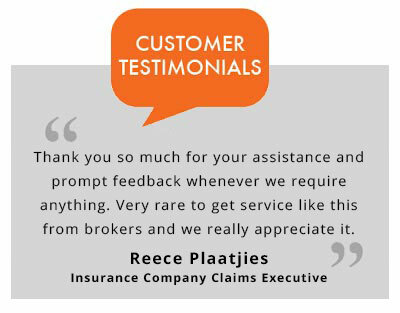 The utter destruction affected several of our clients who experienced devastating losses. We worked tirelessly to process their claims and still pray for them and all the victims. Durban had its own devastating storm but the people pulled together to clean up and help each other! Both 2017 National Boat Shows were a win for Club Marine. We had greatly increased interest in all our products and it also gave the watersport lovers the chance to view the latest gorgeous boats, marine accessories and water toys in the market. Johannesburg Boat show-goers enjoyed loads of action at the Kyalami Race track and those visiting the V&A Waterfront in Cape Town strolled the jetties in glorious sunshine. Our National Bass Angling team outfished themselves to a spectacular victory and the coveted “World Champions” title in the 13th Black Bass World Championships. Congratulations to August Lingnau, Ruan Wahl, Darryl Quinton, Richard Eldridge, Justy Varkevisser, Shane Estran and Kieron Samkin. They beat 13 nations in this exciting event which was held on the Vaal River. A warm welcome to Megan Sheppard (right) – our New Business Developer – who recently joined CMI’s Durban office. Our dynamic “team-by-the-sea” also includes CMI’s managing member, Caryne Duvenhage (centre) and Cathi Warriner in marketing (left). Congratulations to Kasper van der Merwe – the winner of our Lucky Draw competition held at the 2017 Johannesburg Boat Show!! He won a three-night stay (for six) at the Holsboer Ocean Villa Resort in Umhlanga – AND a One-Day all expenses paid deepsea fishing trip – all worth R12 000! • All readers will have access to the special at the Umhlanga resort over next six months 15% discount. 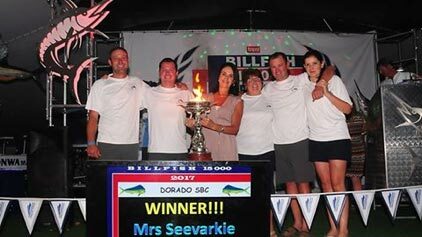 Sodwana’s Elize Smith and her team, fishing off Mrs Seevarkie was unbeatable in this year’s prestigious competition. They caught and released four Marlin – two Striped, a Blue and a Black – to clinch Overall Winner for 2017. 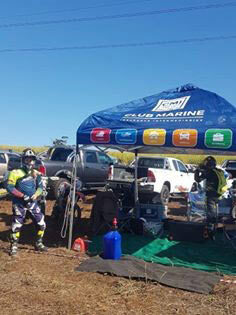 Their many prizes included the Yamaha-powered Carry Cat 670 on trailer and One Year Complimentary insurance from Club Marine – totalling R750 000. Last year’s winners, Michael Fourie and team – on Captain Fine – took second place. Alby Bender, Michael Fourie and Janes Wasserman each won a Year’s Complimentary Insurance in Club Marine’s nightly lucky draws. What better time to start your Cover Plan for your favourite four-legged friends? 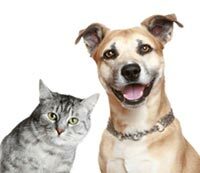 CMI now offers cover for Cats and Dogs Only. These holidays – consider this new security device! jumping off while you drive. being stolen when you stop, park or overnight somewhere. being stolen when parked on its own. This device easily fits onto boats, jetskis, horse boxes, caravans, 4×4 off-road trailers, bike trailers and more. There are different models to suit different needs and a limited lifetime guarantee! Ask about the CLUB MARINE discount vouchers of R150 (10% discount) which are available for online purchases. Limited offer – get yours now! To get to your holiday destination glitch-free – make sure you’re towing legally! Take note of these regulations for towing boats, trailers or caravans. Only allows you to tow unbraked trailers lighter than 750kg (fully laden). Check your vehicle’s Tare (licence weight of an empty vehicle). It needs to be double that of the trailer. So, if your trailer weighs 750kg, the drawing vehicle must have a Tare of 1500kg. Even slightly less is illegal! Code EB licenses: (light motor vehicles able to draw a boat, trailer or caravan). Allows the driver to tow up to 3500kg. If the trailer exceeds 750kg and has its own braking system, the weight of the vehicle must be equal to, or more than, the weight of the trailer. Trailers with a GVM that exceeds 750 kilograms must have overrun brakes installed. Beware of overloading.To pack within the weight limit:Subtract the trailer’s tare mass (its actual unloaded mass) from its GVM (maximum weight/mass when fully loaded). So, if your trailer’s GVM is 750 kg and its tare mass 150 kg, the maximum you can load is 600 kg. Pack properlyIf you have a single-axle trailer, pack heavy goods as close to the axle as possible.The ideal centre of gravity is just ahead of the axle – for a nose loading of around 10% of the trailer’s GVM. Make sure your load is properly secured – to avoid shifts during towing which can alter the nose mass and affect stability. For towing purposes, he says the efficiency of this braking system is exceptional on both small and large trailers and comparable to motor vehicle brakes. Maintenance is considerably less than cable operated, drum braked systems. The coupler travel is approximately 30mm so there is virtually no delay between the vehicle braking and trailer braking. There’s much to look forward to this winter break – which is just around the corner. Culture vultures will head off to the Eastern Cape for the popular Grahamstown National Arts Festival and others will celebrate Mr Nelson Mandela’s birthday, on July 18th. They’ll contribute 67 minutes of community service, at different locations countrywide. 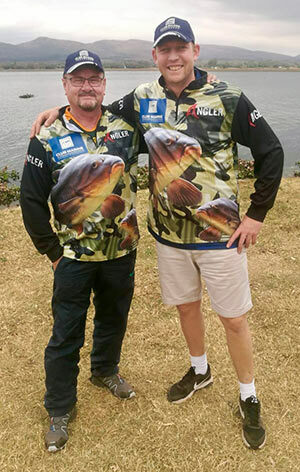 KZN plays host to hundreds of skiboat anglers, who are expected to fish in The Umhlanga Interclub Species Invitational and Shelly Beach Festival competitions – while some of SA’s top bass anglers will fish in President’s Test at Inanda Dam. They’ll be hoping for a possible place in the national side. 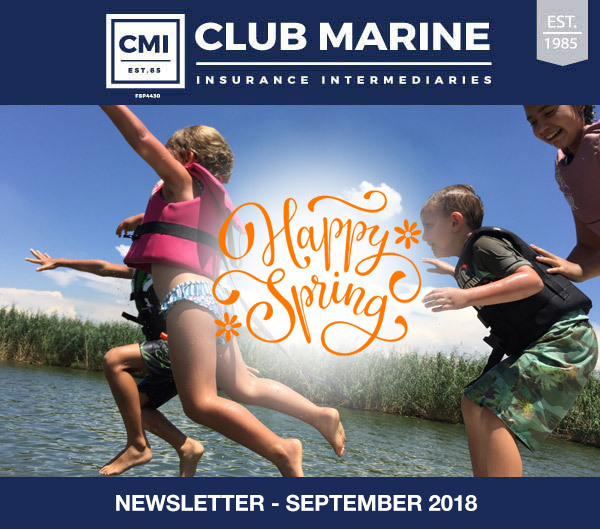 Watersport lovers and holidaymakers trust CMI Insurance to keep them covered 24/7/365 … at home, in their businesses and while they travel! Do you? You get Cash Back with our new “Secure Bonus” cover! This exciting product has been added to all our new and renewing domestic policies and has two main features. The value of your vehicle is fixed at retail price for five years, and should there be a claim at any time within this period – settlement would be calculated at that fixed value and not on a depreciating scale. 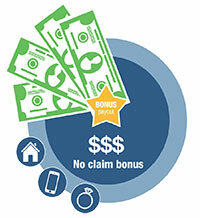 NO-CLAIM BONUS PAYOUTSNo claims on any section of your domestic policy = bonus time!! If you don’t claim for three years you’ll get – a portion of your premiums paid back. After another two claim-free years, you’ll get more cash back and again if you’re claim-free for another year. After this… if there are still no claims – you’ll get yearly pay-outs! – ask about our Secure Bonus cover! 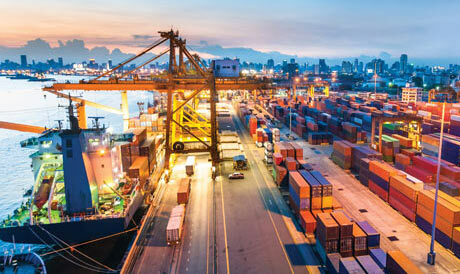 Take a closer look at the insurance options and costs available on your internationally-bound cargo – and you could save thousands on premium. CMI’s comprehensive cover will ensure your goods are properly protected and your money stays safe where it belongs… in YOUR bank account! 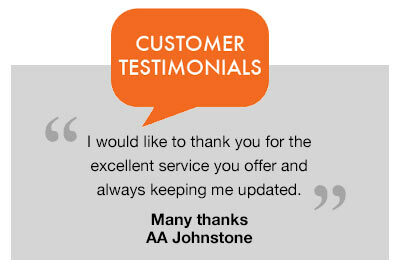 We’ll help you compare – call us for more information. 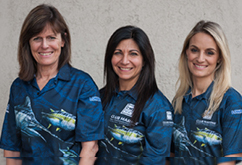 Congratulations to Team Club Marine’s Lyn Adams, who recently took Top Lady Angler in this popular Species competition and second place in the Top Angler standings. Her 124.6 points was just shy of winner Daryl Bartho’s 128 points! Lyn’s Greater Barracuda and 14.8kg Cobia (a pending All Africa ladies record) on 15kg line – clocked up her winning points, along with the other fish she caught. She and team-mates Stefan du Plessis, Navigate’s Russell Duvenhage and Ralph Jones caught Couta, Prodigal Sons, Yellowfin Tuna, Yellow Spotted Kingfish, Bonnitos, Greater Barracuda among others – to take 9th spot overall. Piet Viljoen’s 33.6kg Giant Trevally (GT) was the biggest fish of the competition, landing the big prize – a Yamaha-powered SeaCat 520 skiboat on trailer. 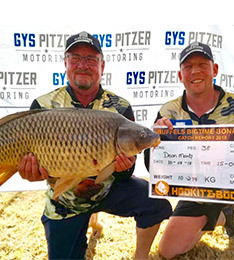 Team-mate, singer/actor Bok van Blerk, caught the third biggest fish – another GT of 22.1kg. A total of 46 fish were measured, recorded (and released). Team Club Marine’s Lelani and Sesh enjoyed the festive vibe at the popular LA Sport 4 x 4 Products in Action show – recently held in Pretoria. Many visitors popped into CMI’s stand for updates on the latest insurance products and benefits. Lelani was very excited to test-drive the brand new Ford Ranger XLT on the 4 x 4 Endurance track. Well-known Afrikaans singer Jay was hugely popular with the crowds and Pieter Koen also proved to be a hit! 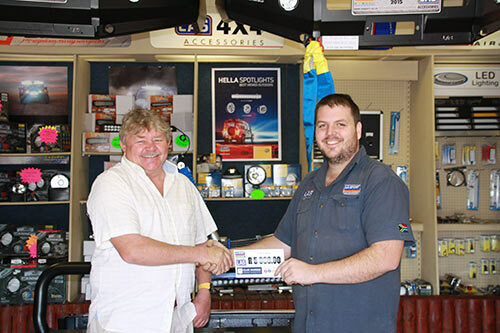 Peter Rynders was the proud winner of the Club Marine Lucky Draw competition at the LA Sport Products in Action 4 x 4 Show. Peter won a R5,000 LA Sport Voucher. 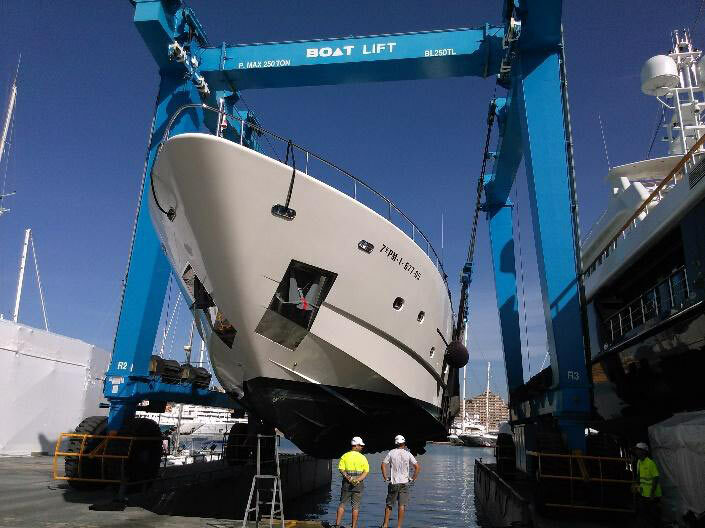 Looking for somewhere to store your boat? 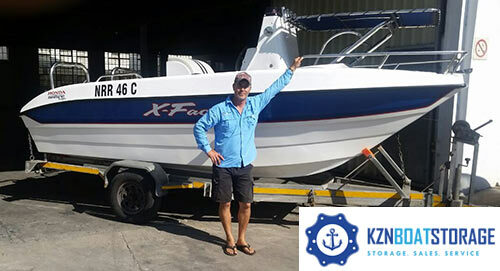 Mikhael Ebelthite, who is well known to boaters and the industry, is now running KZN Boat Storage! This popular national boat show is moving to a new venue this year and will now take place at the Kyalami Grand Prix Circuit, Midrand! 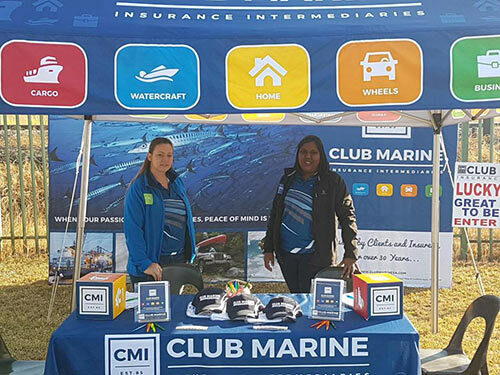 Come and meet the CMI team at our outdoor marquee stand – where you can get the latest insurance tips and information and enter our FREE lucky draw competition. The show will co-locate with the SA Motoring Experience powered by the SA Festival of Motoring. Organiser Tim Williams says this year the competition will provide more entertainment for family and friends, a free lamb-on-spit dinner for anglers and good fishing… of course! 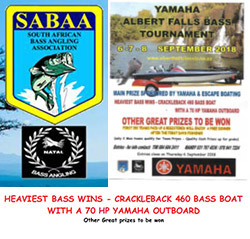 They’re expecting 350 anglers (100 have already entered) – all aiming for the first prize boat – a new 460 Crackleback with 90hp Yamaha motor on trailer from Escape Boating, worth R190 000 and One Year Complimentary Insurance from Club Marine. To book your spot – go onto the SABAA KZN facebook page and fill in the entry form online!